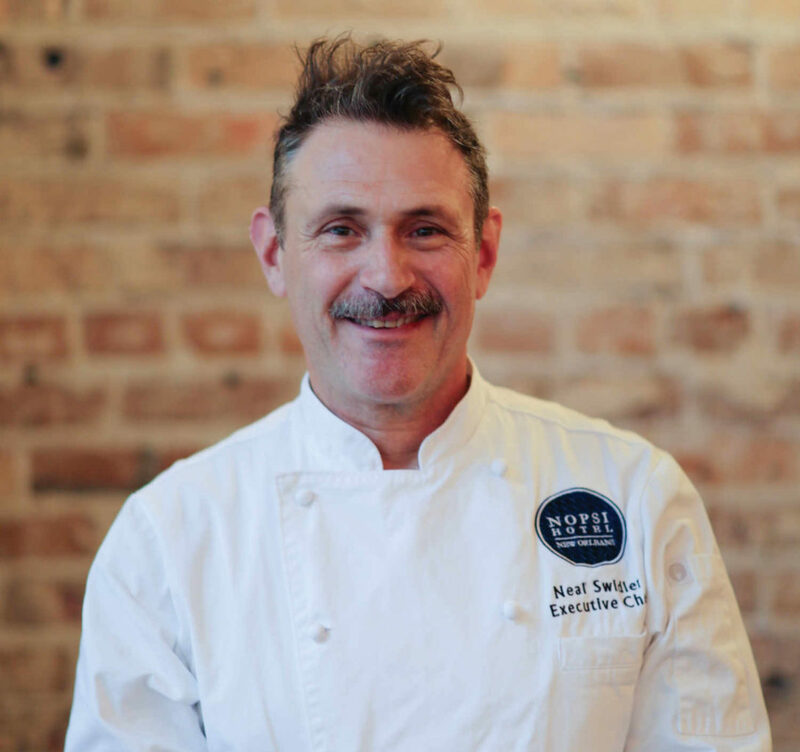 Neal Swidler recently joined the NOPSI Hotel as the new Executive Chef. In this role, Swidler is responsible for overseeing the hotel’s entire culinary operation, including all food and beverage outlets, in-room dining, catering and banquet offerings. Swidler, who used to wear a chef’s coat in high school for fun, loves how people in New Orleans dresses up in costumes. He also loves the fact that New Orleans is one of the main food meccas in the United States — along with New York and San Francisco, he says. Swidler started cooking when he was 15 years old, and he credits his mother and grandmothers with instilling in him a love of food. And after he graduated on the dean’s list from the Culinary Institute of America in 1993, he knew he wanted to come to New Orleans. A longtime New Orleans chef, Swidler draws from an impressive career spanning more than 20 years of executive-level experience at some of the most acclaimed kitchens in the city, including 10 years with Emeril Lagasse’s New Orleans restaurants, serving as chef de cuisine at both NOLA and Emeril’s Delmonico, as well as corporate chef and concept development at NHS Restaurant Consulting. He also was Executive Chef and owner of the award-winning pan-Asian restaurant, Lucky Rooster. His impressive resume of culinary achievements also includes being the winner of the Food Network’s Cut Throat Kitchen Season 6; being featured in the cookbooks Prime Time Emeril and From Emeril’s Kitchens; and Lucky Rooster being named as having the Top 25 Best Chicken Wings in the Country by Gourmet’s Epicurious Magazine. He joins NOPSI Hotel from his most recent appointment at Broussard’s Restaurant. At NOPSI, Swidler has expanded the number of seasonal items and ingredients on every menu, and he has made significant modifications to the Public Service menu, the hotel’s signature restaurant. Some of the menu highlights include shrimp toast with creole tomato glaze and spicy boiled potato salad; Rockefeller bisque with cornmeal crusted oysters and applewood smoked bacon; and heritage beef tenderloin filet with Brabant potatoes, bacon jam Brussels and cambozola. Neal Swidler shares one of his favorite recipes. Sweat mushrooms and veggies in olive oil 5-10 minutes without coloring. Add butter and allow to melt. Add herbs and seasoning. Stir in flour. Cool for 15 minutes stirring often, allowing flour to cook. Meanwhile, boil milk, stock worst and soy together. Steadily add cream mix to vegetable mix, stirring constantly. Return to simmer and cook for 20 minutes. Adjust seasoning and thickness (as needed with cornstarch slurry).